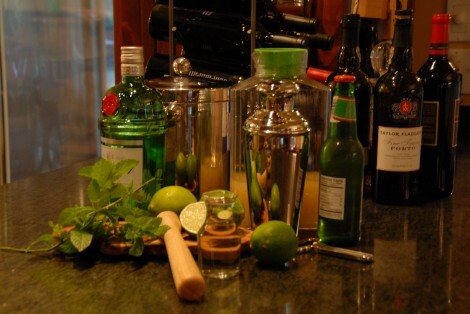 The Gin Gin Mule is an important drink to me, and has been since I first encountered it 8 years ago. I would like to say I discovered it while sitting in Pegu Club (flash website warning), doing something really sophisticated, because that’s where this drink was created by master mixologist and owner Audrey Saunders. I would like to say that, but it’s not the way it happened. I was on a flight to or from somewhere, and sitting on the runway at La Guardia reading the airline magazine. That’s what we used to do, before iPhones and iPads, and always on everywhere high-speed wireless networks. We read airline magazines, and when that ran out the we read the Sky Mall, and briefly contemplated buying an outdoor loud speaker poorly disguised as a rock. And since this was before the Airline Passenger Bill of Rights we sometimes sat on the tarmac until all available reading material was exhausted, and then finally we would look at that spreadsheet or presentation that was the reason for the trip in the first place. So, I saw the Gin Gin Mule recipe and a nice write-up on Ms. Saunders in an airline magazine. For some reason, perhaps because Pegu Club looked so comfortable while I was stuffed into an airline seat with limited air conditioning, or perhaps because the drink seemed so exotic and culinary, I was moved to tear out the page and make it as soon as I got home. It didn’t disappoint. Spicy homemade ginger beer, lime, mint, gin, and just enough sweetness to balance it all out. It was a revelation for me. I moved away from just making gin and tonics as a summer time drink, but more significantly it made me look at mixology and cocktails in a whole new light. This drink involved grating ginger root, and making ginger beer. This was cooking. In the years since, I’ve tweaked it a bit. The original insisted on homemade ginger beer, and sometimes I do that. However, it’s gotten easier to find really spicy, Jamaican style ginger beers in the market. Not only does that make the drink easier to make, but I like the carbonation as well. Mixing club soda into a drink made with homemade ginger beer just dilutes it, and running ginger beer through your soda siphon is a recipe for a sticky, funky mess. A couple points about bottled ginger beer – the sweetness ranges from barely sweet to cloying, and the spicy-ness has a similar range. If you are using a pre-made ginger beer, taste the drink before you add all of the simple syrup. Use just enough to muddle the mint, and reserve the rest to stir in as needed. Muddle the mint leaves with the lime juice and simple syrup in a cocktail shaker. If using a bottled ginger beer for the first time, reserve 1/2 ounce (15 ml) simple syrup to stir in as needed. 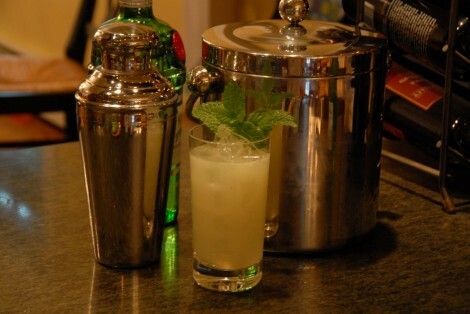 If using homemade ginger beer, add to the cocktail shaker with muddled ingredients. If using bottled or carbonated ginger beer, wait to add it so that you don’t loose the bubbles, or blow cocktail all over yourself when you remove the shaker cap. Add gin to the ingredients in the shaker, along with 2 cups of ice. Shake well. Strain into tall highball glass filled with fresh ice. If using carbonated ginger beer, add it now and stir it in. Test for sweetness, and add simple syrup as needed.